These Southern Style Pressure Cooker Collard Greens are flavorful, tender, and cooked in half the time than the stove top method. 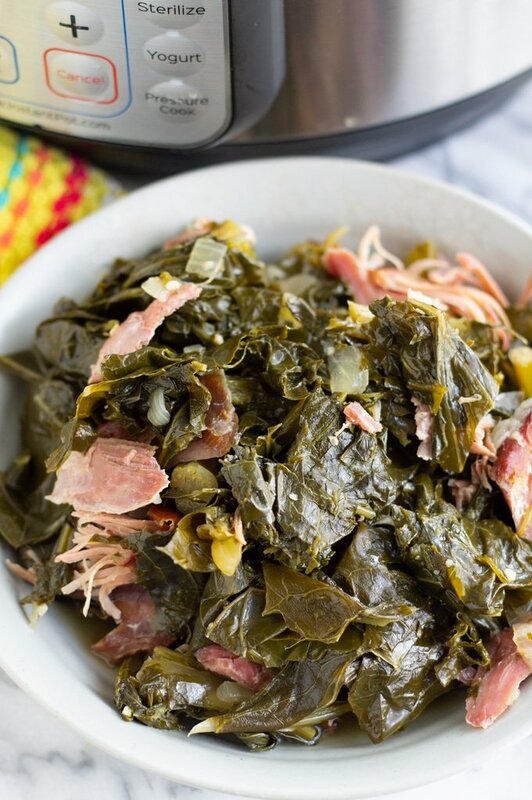 Now you can enjoy collard greens any day of the week! This post may contain affiliate links for your convenience. My full disclosure is available here. If you live in the South, then you know all about the amazing way collard greens are cooked down here. For me, southern style collard greens are like a dream come true. In fact, it’s a must item I have to have on my Thanksgiving plate. I avoided making it at home for the longest time because of how long the process was of making the greens. First, it took so much time to do the soaking and washing. Then, it took hours of cooking it on the stove to make sure they were tender. Then, there’s the smell…that good ol’ stinky collard greens smell. Yea, these were the reasons why I avoided cooking collards at home for the longest. But the Instant Pot Electric Pressure Cooker came to the rescue and now I can make collards in less than an hour! 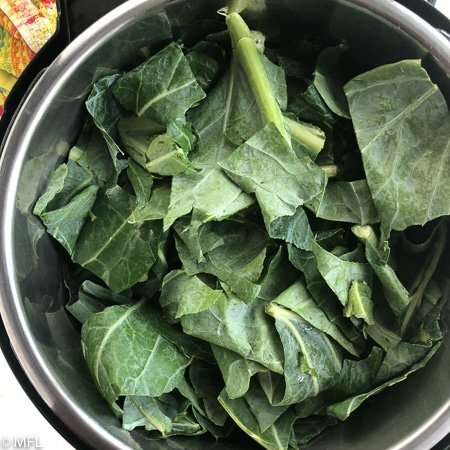 I’m sharing my one pot collard green recipe that can be made with little to no effort while you prepare the rest of your dinner. Lookout Thanksgiving, my collards are going to be the easiest thing you make. Collard greens are full of many essential vitamins and they’ve been noted as one of the vegetables that can aid in the prevention of cancer. You can read more about all the great health benefits of here. Also, collard greens are delicious when prepared right and are a great way to introduce kids to vegetables. My 10 year old loves these southern style collard greens so I make them quite often. 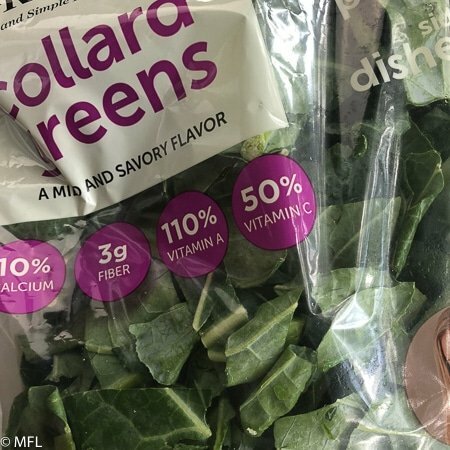 Fresh or bagged Collards, which to use? 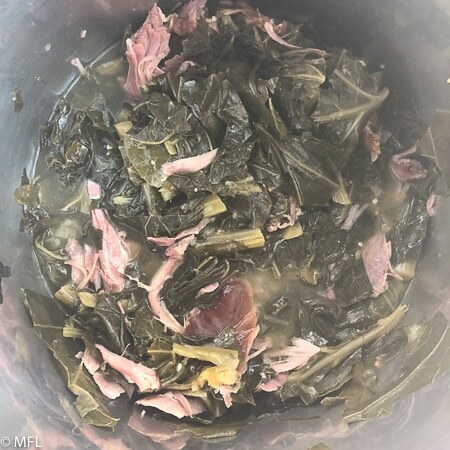 I’ve made this recipe with both fresh collard greens (the ones that require all that soaking and washing) and the collard greens you find in a bag in the store. Guess what the difference was? Absolutely nothing…except the price and convenience. The bag was about 2 dollars more than what I spend on the fresh collards but it was so much more convenient. No longer will I take hours and hours to wash my collard greens. 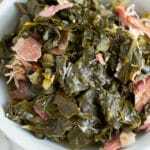 If you want to use fresh collards, you can read more about cleaning them here. Or you can be like me and BUY THE BAG. What makes these pressure cooker Collard Greens so Flavorful? That good ol’ turkey leg. 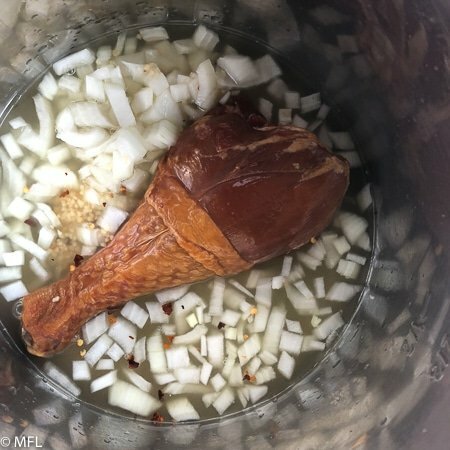 I like to add a fully cooked smoked turkey leg to the Instant Pot Pressure Cooker. You can find these in any grocery store. It brings so much flavor to the collards. I don’t even add salt when I prepare this recipe. It’s just not needed. I prepared this recipe in my 6qt Instant Pot electric pressure cooker. The pressure cook time for this recipe as written is 35 minutes. That is the perfect amount of time to allow the turkey leg meat to fall off the bone and to have the collards soften without turning to mush. If preparing this recipe without the turkey leg, adjust the pressure cook time to 25 minutes. 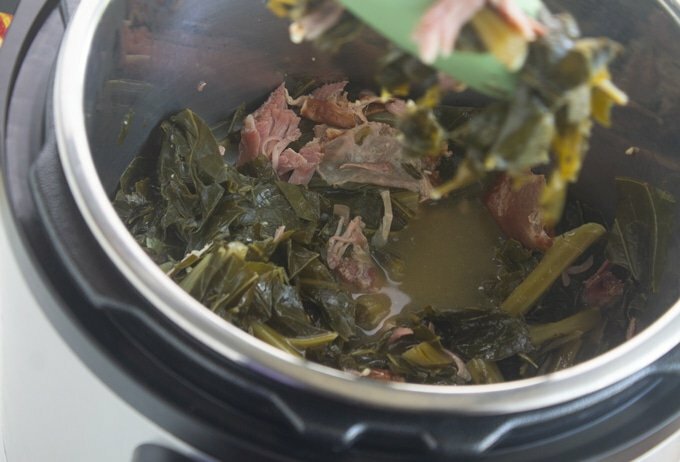 Cooking collard greens in your pressure cooker is so easy it should be done more often. Add smoked turkey leg, onion, garlic cloves, red pepper flakes, chicken broth into Pressure Cooker. Then add collard greens on top, pushing down so that the greens are not sticking out the pressure cooker. Pressure cook on high pressure for 35 minutes. Open lid and remove turkey leg from pressure cooker. Use forks to shred the meat off the bone, returning the meat to the pressure cooker. Add Apple cider vinegar to the collards and stir. To make this dish vegetarian, use vegetable broth and adjust the pressure cook time to 25 minutes. This recipe was prepared in a 6qt Instant Pot. Please adjust accordingly for 3qt and 8qt models. Add the first four ingredients and red pepper flakes to the Instant Pot. Add collard greens to the top of the other ingredients. Slightly push collards down so they aren’t sticking out of the top. Don’t worry, they shall cook down. 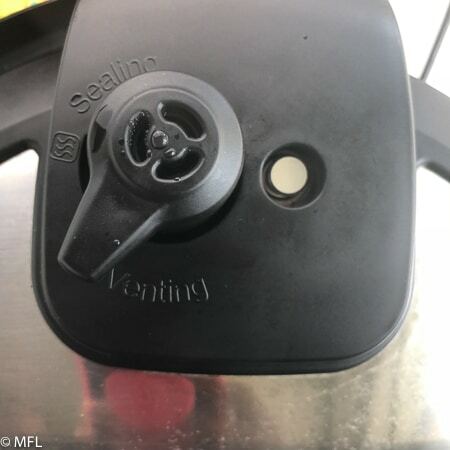 Place lid on Instant Pot, ensuring the valve is set to “Sealing.” Pressure Cook on high pressure for 35 minutes. 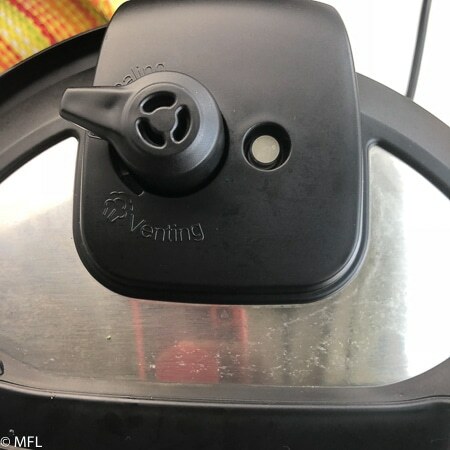 Once timer on the instant pot is done, quick release the pressure by switching it to “venting”. Be careful as hot steam will shoot out, so do so slowly and carefully. Once the little metal pin goes down, the pressure has been released and you can open the lid. 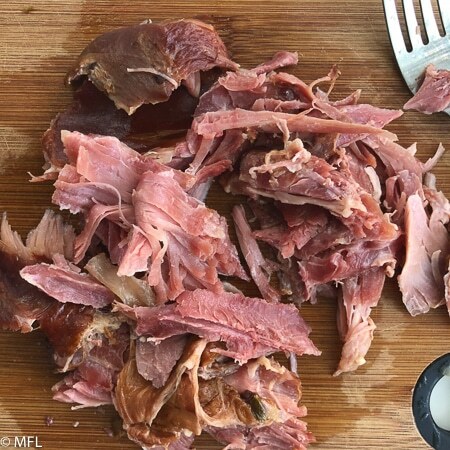 Remove the smoked turkey leg from the pot and shred with a fork. It should fall off the bone. I made this with your recipe, and it was perfect! First time I ever cooked collards from scratch, won’t be buying canned anymore! Delicious recipe. However, I had to dispose of the silicone seal I used as the smoke odor from the turkey leg was overpowering even in my cupboard. I could not get rid of the odor. And it passed the taste on to the next dish I made using the same seal. Possibly my turkey leg was overly smoky, but I don’t know how you would tell that at purchase. Not sure if this is helpful but I looked it up this morning having just got an instant pot! I followed your recipe but my turkey leg was rough and did not fall off them bone. I did use a smoked fully cooked leg. Hi Valerie, I’m sorry to hear that turkey leg didn’t fall off that bone. That’s one of my favorite things about this recipe. You could definetly try increasing the cook time by a 10-15 minutes next time but I wouldn’t go more than 1 hour or your greens will be mushy. Would it be the same cook time if I double the recipe? yes. My only caution with doubling is making sure it can all fit in your pressure cooker. I have a 6qt and it was pretty full with 1lb of greens. You said to make adjustments for the 3qt or 8 qt… does this mean for time or amount of ingredients? I would expect the amount of ingredients to change but not the time but I just want to be sure. If I adjust for time for my 3 qt how much time would you recommend? Thanks! Hi Christine, You are correct about the time staying the same although you pressure cooker may reach pressure a tad bit quicker than it would in the 6 qrt. I tried this recipe. It was easy to make, cook, and food was tasty and healthy. Awesome Rosa. So Glad you enjoyed it. Thanks for letting me know. I haven’t tried frozen greens in my pot yet so I can’t promise it would work in this recipe with the cook time. You need to include “red pepper flakes” to the list of ingredients to be added before the collard greens in the instructions. I didn’t realize that was when it should be added until after I had already started the cooking process and scrolled on down to the pictures and read one of the captions. Thanks! Hi Beth, thank you for letting me know. I have updated the recipe instructions. It will still work out if you add the red pepper flakes when pressure cooking is complete. I like to use smoked ham hocks cut into sections when I cook greens. Some have bones still in them, while some don’t. Would you still cook for 35 minutes? Hi Kate, I would still keep the cook time at 35 minutes. Can this be done in the crock pot also? I haven’t personally used my slow cooker for collards but it would wor. Just cook on low for 8-9 hours and increase the chicken broth by about 3 cups, adding more if needed. 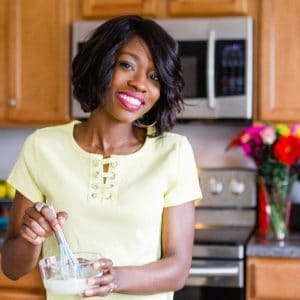 I am always looking for new recipes for my pressure cooker, I can’t wait to try this recipe!